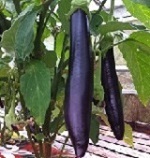 Aubergines grow successfully in pots and are best in a greenhouse or sunny, sheltered spot. They need little maintenance but removing some of the lower leaves helps the fruit ripen. In hot, dry weather watch out for Red Spider Mite. Mist the undersides of the leaves to keep them away. French variety with long, dark purple fruit. Early. Early maturing, deep purple/black oval fruit. Reputedly does well in difficult growing seasons! Baby fruited, similar to Ophelia but, we think better. Dark purple fruit born in clusters. (a favourite in 2010). The earliest to mature with good tasting, standard shaped fruit. 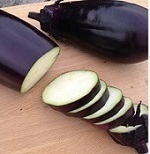 Purple skin is not as glossy as other varieties. 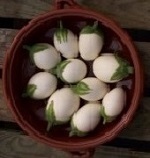 Pretty little aubergines look just like white eggs and cook well too!